If you could position yourself in a unique way with authority and credibility, what would it do for you? Today, you’re going to hear from Coach Micheal Burt, a proven coach both on the athletic field and in the business world. 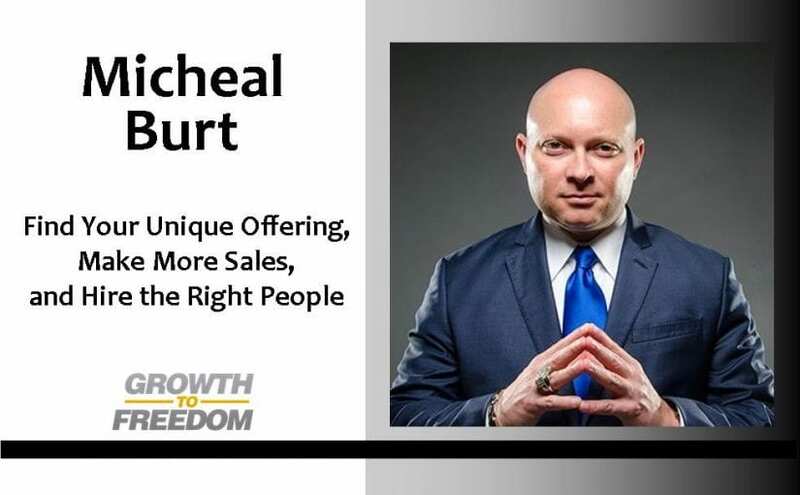 Micheal has an amazing knack for seeing the trouble spots in businesses quickly and giving clear, cogent advice and wisdom about how to position yourself as the go-to expert (and more). You’ll discover Micheal’s “Cheetah and Zebra” strategy, the 4 Missing Structures, 3 Types of People in Business, How to Articulate your message, The 2.2 Millimeter Concept, CRUMBS Concept, and you’ll even hear Micheal talk about his wife and daughter and how he balances entrepreneurship and home life – so you can grow, excel, accelerate, and dominate your marketplace.